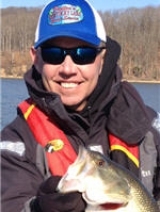 When looking for bass on Kentucky Lake in April, an angler will want to keep in mind that the bass will be migrating toward the spawning areas. On Kentucky Lake, that will be in the back of the creeks and main lake islands. Early April – first two weeks – look for channel banks leading into the back of the creeks. I will look for channel banks with chunk rock (5- to 12-inch chunk rock is the key rock). My boat will be in 12- to 7-foot depths and even shallower toward the later part of April. This is a time when my Rat-L-Traps will out-produce anything else. The way I like to fish it is letting it drag the bottom, bouncing it off the rocks, and also by letting it fall to the bottom and hopping it back to the boat in short, 1-foot hops. I will fish it on 15-pound Seaguar AbrazX and a Lews 7-foot David Fritts glass rod. My second choice of baits is a SPRO Little John and Little John MD in spring craw and chartreuse nasty, and I have Bag5Baits.com custom paint a rootbeer that is very productive in the spring. About mid-April, our lake will usually start rising, and you will see a yellow wild flower growing along the shoreline. As the lake rises, the water will flood these yellow flowers and then that’s where you want to be fishing. I will fish spinnerbaits, swimbaits, a ⅜- or ½-ounce Elite Pro swimbait head and a 5-inch swimbait, and also flip a ZOOM Baby Brush Hog, Z Hog and a Tube in the flooded flowers. Toward the end of April, the water will keep rising and the water levels will start to flood the buck brush in the back of the creeks, and the bass will follow. That’s when I will start flipping the buck brush with the same ZOOM baits as above and a jig. I will flip with 25-pound Seaguar fluorocarbon and 50-pound braid. I love when this happens because every fish in the lake moves into this cover to spawn. I also highly recommend using a tungsten weight; this weight is smaller in size, and it is so much more sensitive. Allowing me to feel the slightest bite, I use a ⅜- and ½-ounce weight by protungsten.com with a 7-foot, 6-inch Lews flippin’ stick. Good fishing, be safe and wear your life jacket!